A player from the opposing team has just received a penalty for tripping, and for the next two minutes, your squad has a man advantage. Congratulations, you’re about to go on a power play! Few things are as important to the success of a hockey team on any level as its ability to score goals during a power play. A power play occurs when the opposing club is whistled for a penalty and one of its players goes to the penalty box. Thus, one team has the numerical superiority during the penalty time — unless the team with the advantage scores, in which case the power play ends. Coaches use a variety of plays to try to score while they have the advantage, and the power play often creates some of the game’s most exciting moments — whether it’s a flurry of slap shots from the point (that area on the rink just inside the blue line near the boards) or a scramble for rebounds in front of the net. A good power play is a deadly weapon, and no team can win a championship without one. Control is a key when it comes to setting up the power play. Control and patience. Most National Hockey League teams use what is known as the umbrella (see Figure 1). In the middle of the ice, just inside the blue line of the offensive zone, is the shooter (#2), the player on the power play team who fires the puck at the net best. To his right, farther down the ice and along the boards, is another forward (#3). And on the opposite side of the zone, perhaps a bit closer to the blue line, is another teammate (#1). Parked in front of the net is another forward (#4), usually a tough guy who can muscle his way around the opposing defensemen, screen the goaltender, punch in rebounds, and deflect in shots. A little bit higher up (closer to the blue line), but still in the middle, is the center (#5). Figure 1: The umbrella in action. 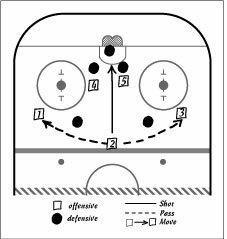 The basic idea is to move the puck among the five offensive players until one of them has an opening and can shoot. Crisp passes are essential, and so is making use of the man advantage. Get the puck to the open man. And be sure to take what the other team gives. If a defender comes to you, then one of your teammates is open somewhere. Try to find him. And even if you don’t have the puck, make something happen. Get in the goalie’s way. Keep the puck in the zone if a defender tries to shoot it out. A good professional team can work a power play like magic, but kids don’t have to be quite so sophisticated. Forget about slap shots, for example. The big windups look flashy but are far too difficult for younger players to translate into good shots. Kids should concentrate instead on basic wrist shots, which can be even more effective, not only in scoring goals but also in setting up deflections and rebounds.